Summer 2017 has arrived, but the hotter temperatures have not stopped us from providing some downright cool events for the clients we serve. 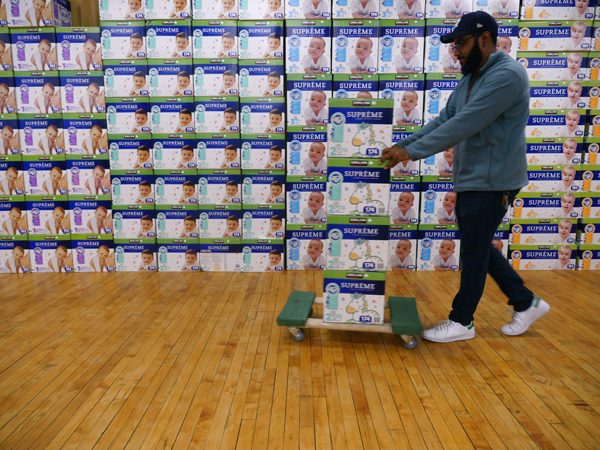 This May marked the return of our Mother's Day Diaper Drive for 2017 and our mission to distribute more than 50,000 diapers for families in need. The demand for diapers has grown larger than we have projected, with new inquiries about baby formula as well. This has caused us to extend our Diaper Drive out through July! We’d love your help in achieving our ambitious but worthy goal. Our "PB&J Days" Program continues to be a success, with both returning and brand new corporate volunteers rolling up their sleeves to make peanut butter and jelly sandwiches. Hundreds of volunteers from these organizations donated their time to make over 10,000 sandwiches to help us feed those in need. Ross Stores continued to donate thousands of new home goods and clothing items for our clients. Once a month, Mark Sanchez from Ross coordinates a shipment of these items to our storage facility. The items – everything from dish towels, spatulas and soap dispensers to frames for pictures and socks for kids – are organized and boxed for distribution throughout our network of pantries. All our programs, activities and events all share a common theme: nourishment for the mind, body and soul of individuals and families who need a helping hand. 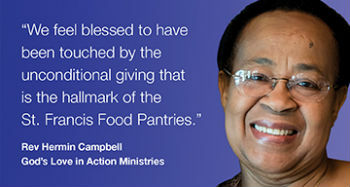 Our Food Distribution to the network of over 40 pantries, shelters and soup kitchens around the New York area is the highlight of our work.